A Siemens train (the old Gold Line train) entering the platform in 2005. Memorial Park is a below-grade light rail station in the Los Angeles County Metro Rail system. It is located at Holly Street and Arroyo Parkway in Pasadena, California. The station is served by the Gold Line. Situated on the northern edge of Old Town Pasadena, Memorial Park Station is located in a trench beneath the Holly Street Village Apartments, which were constructed in 1994 in anticipation of a light rail station at this site. This station features station art called The First Artists in Southern California: A Short Story, created by artist John Valadez. 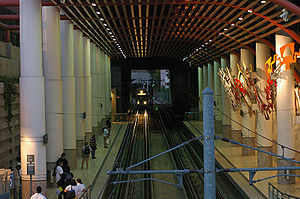 Wikimedia Commons has media related to Memorial Park (Los Angeles Metro station). This page was last edited on 8 February 2019, at 01:31 (UTC).